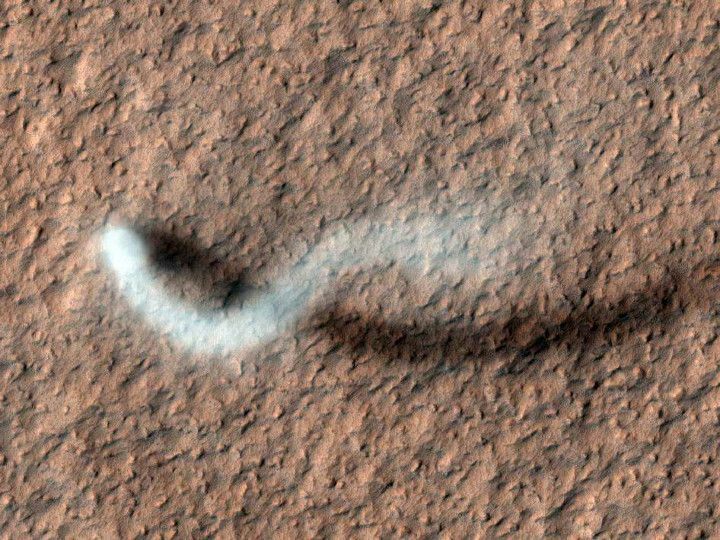 The Martian twister rises up on a huge column of dust more than half a mile (800 meters) high in the new image, which was captured by NASA’s Mars Reconnaissance Orbiter on Feb. 16 as the spacecraft passed over the Amazonis Planitia region of northern Mars. The 100-foot-wide (30-m) dust devil curves slightly, pushed by a westerly breeze. Tracks from previous whirlwinds are also visible in the Mars twister picture, showing up as streaks on the Red Planet’s surface. The dust devil’s shadow can also clearly be seen in the photo. NASA’s Mars Reconnaissance Orbiter has been examining Mars with six science instruments since arriving at the Red Planet in March 2006. The spacecraft continues to provide valuable insights into the planet’s ancient environment and how processes such as wind, meteorite impacts and seasonal frosts still affect the surface of Mars today, NASA officials said. NASA launched the Mars Reconnaissance Orbiter in September 2005. The $720 mission is NASA’s youngest Mars orbiter flight to date, but has beamed more data to Earth than all other interplanetary missions combined.